www.pivnigalerie.cz or www.1stczechbeergallery.com The Pivn� Galerie-now in its 7th year-is the home of beers from small, independent brewers of Czech Republic. We have over 180 types of hard-to-find beers from breweries that still use true traditional methods. 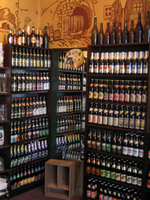 You won�t find these beers anywhere else in Prague and you won�t find anything like our store anywhere else in the world! Over 180 Types of unique Handcrafted Czech Beers from small breweries Take them home with you or sample in our on-premesis tasting room! We also have Trappist and other fine Belgian beers for sale. Genuine Souvenirs from Breweries! Glasses, Shirts, Beer Mats, & Gift Baskets We also have fine wax candle reproductions of antique Czech beer bottles--a Pivn� Galerie exclusive! Tote your beers in one of our � Brew Tool Boxes�! Beer Tastings and Beer Dinners for your Group, Party or Business Our beer experts will guide you through a special program where you�ll learn more about the history, processes and legends, and you�ll get to taste some great beer! Available in English, Czech, Swedish, Danish or Norwegian!